Though Cluss had begun work in 1862 on the Navy Yard Foundry Building and the Wallach School, his first completed building was the Metropolitan Hook and Ladder Company's fire engine house. Dedicated by Mayor Wallach in February 1864, it reflected the city's decision to assume responsibility for building fire houses and paying at least some of the formerly all-volunteer firemen. The Evening Star reported the event and included the first of what became a characteristic Cluss "news release," a publicity device to advertise his work that he employed throughout his career. 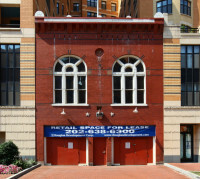 It included a detailed description of the building's dimensions (two stories with belfry), including its doors and windows ("in the French style"), its materials (pressed brick), and its features (hot air furnace, "Potomac water", water closets, ventilators, second floor meeting room orchestra gallery and chandeliers). Cluss news releases always praised and named the architect, contractors, and civic officials. "The building is a substantial one," he reported, and "reflects great credit on all concerned," especially in view of the total cost of $5,000, which he said "is regarded as very low, when the size and character of the work is taken into consideration." The building remained in use as a fire engine house under different names until 1974. The Metropolitan Hook and Ladder Company's emblem, including the letters "M.H.L" is still on the front façade. Vacant for a long period of time and situated between tall condo buildings, the fire engine house was in danger of demolition. Thanks to an investor, it could be renovated in 2011/12 an has been preserved for use as the "Engine House 6" restaurant without disrupting the basic plan of the building. The fire engine house is one of only 11 buildings Cluss designed that survive and it is the oldest one.